Keynote speakers at the cell signaling meeting in Luxembourg have provided chapters on hypoxia signal transduction, phosphoserine/threonine-binding domains, targeting of polycomb repressive complexes, conserved signaling mechanisms in innate immunity, and signal transduction by stress-activated MAP kinases. Other topics included among these reports on recent research are receptor signaling, protein kinase cascades as therapeutic targets, cell death in cancer, inflammation-specific signaling, cell signaling pathways leading to regulated chromatin modifications, and transcriptional control. The chapters have been published in four volumes (Part A to D), offering a comprehensive overview about this exciting topic. This second volume focuses on basic research, and the chapters are divided into the following sections: oxidative stress, transcriptional control, HDAC, and novel technological and therapeutic approaches. 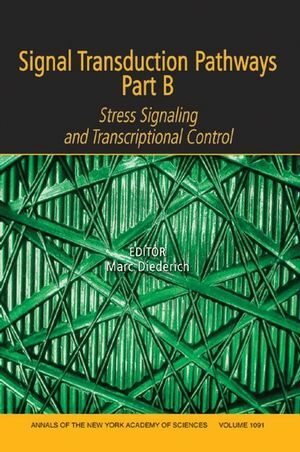 Marc Diederich is the editor of Signal Transduction Pathways, Part B: Stress Signaling and Transcriptional Control, Volume 1091, published by Wiley. 1. Oxidative Upregulation of Bcl-2 in Healthy Lymphocytes: Silvia Cristofanon, Silvia Nuccitelli, Maria D’alessio, Flavia Radogna, Milena De Nicola, Antonio Bergamaschi, Claudia Cerella, Andrea Magrini, Marc Diederich, and Lina Ghibelli. 2. Intracellular Pro-oxidant Activity of Melatonin Deprives U937 Cells of Reduced Glutathione without Affecting Glutathione Peroxidase Activity: Maria Cristina Albertini, Flavia Radogna, Augusto Accorsi, Francesco Uguccioni, Laura Paternoster, Claudia Cerella, Milena De Nicola, Maria D’alessio, Antonio Bergamaschi, Andrea Magrini, and Lina Ghibelli. 3. Mitochondrial "Movement" and Lens Optics following Oxidative Stress from UV-B Irradiation: Cultured Bovine Lenses and Human Retinal Pigment Epithelial Cells (ARPE-19) as Examples: Vladimir Bantseev and Hyun-Yi Youn. 4. 2-Methoxyestradiol Inhibits Superoxide Anion Generation while It Enhances Superoxide Dismutase Activity in Swine Granulosa Cells: Giuseppina Basini, Sujen Eleonora Santini, and Francesca Grasselli. 5. Role of Reactive Oxygen Species in Kv Channel Inhibition and Vasoconstriction Induced by TP Receptor Activation in Rat Pulmonary Arteries: Angel Cogolludo, Giovanna Frazziano, Laura Cobeno, Laura Moreno, Federica Lodi, Eduardo Villamor, Juan Tamargo, and Francisco Perez-Vizcaino. 6. DNA Strand Breaks by Metal-Induced Oxygen Radicals in Purified Salmonella typhimurium DNA: Ezzatollah Keyhani, Fatemeh Abdi-Oskouei, Farnoosh Attar, and Jacqueline Keyhani. 7. Antioxidant Enzymes during Hypoxia–Anoxia Signaling Events in Crocus sativus L. Corm: Ezzatollah Keyhani, Lila Ghamsari, Jacqueline Keyhani, and Mahnaz Hadizadeh. 8. Ataxia-Telangiectasia-Mutated-Dependent Activation of Ku in Human Fibroblasts Exposed to Hydrogen Peroxide: Jong Hwa Lee, Ji Hoon Yu, Kyung Hwan Kim, and Hyeyoung Kim. 9. Regulation of 2-Deoxy-D-Glucose Transport, Lactate Metabolism, and MMP-2 Secretion by the Hypoxia Mimetic Cobalt Chloride in Articular Chondrocytes: Ali Mobasheri, Nicola Platt, Colin Thorpe, and Mehdi Shakibaei. 10. Oxidative Stress Response in Telomerase-Immortalized Fibroblasts from a Centenarian: Chiara Mondello, Maria Grazia Bottone, Sakon Noriki, Cristiana Soldani, Carlo Pellicciari, and Anna Ivana Scovassi. 11. Differential Modulation of AMPK Signaling Pathways by Low or High Levels of Exogenous Reactive Oxygen Species in Colon Cancer Cells: In-Ja Park, Jin-Taek Hwang, Young Min Kim, Joohun Ha, and Ock Jin Park. 12. Alterations in Salivary Antioxidants, Nitric Oxide, and Transforming Growth Factor-B1 in Relation to Disease Activity in Crohn’s Disease Patients: Ali Rezaie, Fakhteh Ghorbani, Azadeh Eshghtork, Mohammad J. Zamani, Gholamreza Dehghan, Bardia Taghavi, Shekoufeh Nikfar, Azadeh Mohammadirad, Nasser E. Daryani, and Mohammad Abdollahi. 13. Control of Bioamine Metabolism by 5-HT2B and B1D Autoreceptors through Reactive Oxygen Species and Tumor Necrosis Factor-a Signaling in Neuronal Cells: Benoit Schneider, Mathea Pietri, Sophie Mouillet-Richard, Myriam Ermonval, Vincent Mutel, Jean-Marie Launay, and Odile Kellermann. 14. Determination of Oxidative Stress Status and Concentration of TGF-B1 in the Blood and Saliva of Osteoporotic Subjects: Gholamreza Yousefzadeh, Bagher Larijani, Azadeh Mohammadirad, Ramin Heshmat, Gholamreza Dehghan, Roja Rahimi, and Mohammad Abdollahi. 15. Targeting Signal-Transducer-and-Activator-of-Transcription-3 for Prevention and Therapy of Cancer: Modern Target but Ancient Solution: Bharat B. Aggarwal, Gautam Sethi, Kwang Seok Ahn, Santosh K. Sandur, Manoj K. Pandey, Ajaikumar B. Kunnumakkara, Bokyung Sung, and Haruyo Ichikawa. 16. Gene Expression Modulation in A549 Human Lung Cells in Response to Combustion-Generated Nano-Sized Particles: Andrea Arenz, Christine E. Hellweg, Nevena Stojicic, Christa Baumstark-Khan, and Horst-Henning Grotheer. 17. Multiple Levels of Control of the Expression of the Human A_H-J-J Locus Encoding Aspartyl-b-hydroxylase, Junctin, and Junctate: Giordana Feriotto, Alessia Finotti, Giulia Breveglieri, Susan Treves, Francesco Zorzato, and Roberto Gambari. 18. Activation of Nuclear Factor kB by Different Agents: Influence of Culture Conditions in a Cell-Based Assay: Christine E. Hellweg, Andrea Arenz, Susanne Bogner, Claudia Schmitz, and Christa Baumstark-Khan. 19. Atrial Appendage Transcriptional Profile in Patients with Atrial Fibrillation with Structural Heart Diseases: Maria S. Kharlap, Angelica V. Timofeeva, Ludmila E. Goryunova, George L. Khaspekov, Sergey L. Dzemeshkevich, Vladimir V. Ruskin, Renat S. Akchurin, Sergey P. Golitsyn, and Robert Sh. Beabealashvilli. 20. DNA Hypomethylation of CAGE Promotors in Squamous Cell Carcinoma of Uterine Cervix: Taek Sang Lee, Jae Weon Kim, Gyeong Hoon Kang, Noh Hyun Park, Yong Sang Song, Soon Beom Kang, and Hyo Pyo Lee. 21. The MECP2 Gene Mutation Screening in Rett Syndrome Patients from Croatia: Tanja Matijevi, Jelena Knezevic, Ingeborg Barisic, Biserka Resic, Vida Culic, and Jasminka Pavelic. 22. Prostaglandins Regulate Transcription by Means of Prostaglandin Response Elements Located in the Promoters of Mammalian Na,K-ATPase B1 Subunit Genes: Keikantse Matlhagela and Mary Taub. 23. Different Modulation of ER-Mediated Transactivation by Xenobiotic Nuclear Receptors Depending on the Estrogen Response Elements and Estrogen Target Cell Types: Gyesik Min. 24. Effects of TK Promotor and Hepatocyte Nuclear Factor-4 in CAR-Mediated Transcriptional Activity of Phenobarbital Responsive Unit of CYP2B Gene in Monkey Kidney Epithelial-Derived Cell Line COS-7: Gyesik Min. 25. Expression of the E2F Family of Transcription Factors and Its Clinical Relevance in Ovarian Cancer: Daniel Reimer, Susann Sadr, Annemarie Wiedemair, Georg Goebel, Nicole Concin, Gerda Hofstetter, Christian Marth, and Alain G. Zeimet. 26. Isolation and Characterization of the Rat SND p102 Gene Promoter: Putative Role for Nuclear Factor-Y in Regulation of Transcription: Lorena Rodrıguez, Nerea Bartolome, Begona Ochoa, and Marıa J. Martınez. 27. The cAMP-Responsive Unit of the Human Insulin-Like Growth Factor–Binding Protein-1 Coinstitutes a Functional Insulin-Response Element: Ghislaine Schweizer-Groyer, Guillaume Fallot, Francoise Cadepond, Christelle Girard, and Andre Groyer. 28. c-Jun and JunB Are Essential for Hypoglycemia-Mediated VEGF Induction: Bjorn Textor, Melanie Sator-Schmitt, Karl Hartmut Richter, Peter Angel, and Marina Schorpp-Kistner. 29. Altered Gene Expression Pattern in Peripheral Blood Leukocytes from Patients with Arterial Hypertension: A.V. Timofeeva, L.E. Goryunova, G.L. Khaspekov, D.A. Kovalevskii, A.V. Scamrov, O.S. Bulkina, Yu.A. Karpov, K.A. Talitskii, V.V. Buza, V.V. Britareva, and R.Sh. Beabealashvilli. 30. Effects of AT1 Receptor-Mediated Endocytosis of Extracellular Ang II on Activation of Nuclear Factor-_B in Proximal Tubule Cells: Jia L. Zhuo, Oscar A. Carretero, and Xiao C. Li. 31. Retinoic Acid and Histone Deacetylase Inhibitor BML-210 Inhibit Proliferation of Human Cervical Cancer HeLa Cells: Veronika V. Borutinskaite, Ruta Navakauskiene, and Karl-Eric Magnusson. 32. Effects of Histone Deacetylase Inhibitors, Sodium Phenyl Butyrate, and Vitamin B3, in Combination with Retinoic Acid, on Granulocytic Differentiation of Human Promyelocytic Leukemia HL-60 Cells: Rasa Merzvinskyte, Grazina Treigyte, Jurate Savickiene, Karl-Eric Magnusson, and Ruta Navakauskiene. 33. The Histone Deacetylase Inhibitor FK228 Distinctly Sensitizes the Human Leukemia Cells to Retinoic Acid-Induced Differentiation: Jurate Savickiene, Grazina Treigyte, Veronika Borutinskaite, Ruta Navakauskiene, and Karl-Eric Magnusson. 34. Effect of Valproic Acid, a Histone Deacetylase Inhibitor, on Cell Death and Molecular Changes Caused by Low-Dose Irradiation: Darina Zaskodova, Martina Rezacova, Jirina Vavrova, Doris Vokurkova, and Ales Tichy. Part IV: Novel Technological and Therapeutical Approaches:. 35. Protein Folding Information in Nucleic Acids Which Is Not Present in the Genetic Code: Jan C. Biro. 36. Antigens and Cytokine Genes in Antitumor Vaccines: The Importance of the Temporal Delivery Sequence in Antitumor Signals: Maria Jose Herrero, Rafael Botella, Francisco Dasi, Rosa Algas, Maria Sanchez, and Salvador F. Alino. 37. Arrest of Cancer Cell Proliferation by dsRNAs: Tatyana O. Kabilova, A`Lbina V. Vladimirova, Elena L. Chernolovskaya, and Valentin V. Vlassov. 38. Design and Functional Activity of Phosphopeptides with Potential Immunomodulating Capacity, Based on the Sequence of Grb2-Associated Binder 1: Akos Kertesz, Balazs Takacs, Gyorgyi Varadi, Gabor K. Toth, and Gabriella Sarmay. 39. Distinct Activity of Peptide Mimetic Intracellular Ligands (Pepducins) for Proteinase-Activated Receptor-1 in Multiple Cells/Tissues: Satoko Kubo, Tsuyoshi Ishiki, Ichiko Doe, Fumiko Sekiguchi, Hiroyuki Nishikawa, Kenzo Kawai, Hirofumi Matsui, and Atsufumi Kawabata. 40. A New Method to Assess Drug Sensitivity on Breast Tumor Acute Slices Preparation: Pedro Mestres, Andrea Morguet, Werner Schmidt, Axel Kob, and Elke Thedinga. 41. Process Simulation in a Mechatronic Bioreactor Device with Speed-Regulated Motors for Growing of Three-Dimensional Cell Cultures: Mina Mihailova, Vassil Trenev, Penka Genova, and Spiro Konstantinov. 42. Animal Model of Drug-Resistant Tumor Progression: Nadezda Mironova, Olga Shklyaeva, Ekaterina Andreeva, Nelly Popova, Vasilyi Kaledin, Valeryi Nikolin, Valentin Vlassov, and Marina Zenkova. 43. Preparation and Characterization of Recombinant Chicken Growth Hormone (chGH) and Its Putative Antagonist chGH G119R Mutein: Helena E. Paczoska-Eliasiewicz, Gili Salomon, Shay Reicher, Eugene E. Gussakowsky, Anna Hrabia, and Arieh Gertler. 44. Induction of Apoptosis of Osteoclasts by Targeting Transcription Factors with Decoy Molecules: Roberta Piva, Letizia Penolazzi, Margherita Zennaro, Ercolina Bianchini, Eros Magri, Monica Borgatti, Ilaria Lampronti, Elisabetta Lambertini, Elisa Tavanti, and Roberto Gambari. 45. Competition Effects Shape the Response Sensitivity and Kinetics of Phosphorylation Cycles in Cell Signaling: Carlos Salazar and Thomas Hofer. 46. Preparation of Leptin Antagonists by Site-Directed Mutagenesis of Human, Ovine, Rat, and Mouse Leptin’s Site III: Implications on Blocking Undesired Leptin Action In Vivo: Gili Solomon, Leonora Niv-Spector, Dana Gonen-Berger, Isabelle Callebaut, Jean Djiane, and Arieh Gertler. 47. Dual Activity of Phosphorothioate CpG Oligodeoxynucleotides on HIV: Reactivation of Latent Provirus and Inhibition of Productive Infection in Human T Cells: Carsten Scheller, Anett Ullrich, Stefan Lamla, Ulf Dittmer, Axel Rethwilm, and Eleni Koutsilieri. 48. Prostanoids with Cyclopentenone Structure as Tools for the Characterization of Electrophilic Lipid–Protein Interactomes: Konstantinos Stamatakis and Dolores Perez-Sala.